In attempts to save Sathya Sai Baba’s death prediction from ridicule, the Sathya Sai authorities have been claiming that he reckoned his age in lunar years, not calendar years. However, Sathya Sai Baba certainly reckoned in calendar years, which is evident from the following quotes from his published discourses. One can speak meaningfully of lunar months, as shorter than calendar months… but not strictly meaningfully of a ‘lunar year’ because a year is a measure of the time the earth (with its moon) takes to circle the sun. The year cannot be affected by lunar cycles in any way… but Indian shastris like to operate with ‘lunar years’. These have to be corrected every 6 years by the addition of an extra month (to bring the lunar year into some correspondence with the true solar year. The matter is involved, so ordinary devotees, such as Indian villagers or illiterate persons, easily get confused by the arithmetic and prefer to accept what they wish to believe anyhow. All the above quotes involve only calendar year reckoning. As officially reported, Sathya Sai Baba passed away on 24th April 2011. [2011 – 1926 = 85] Note that none of the various fanciful calculations of the number of “lunar years” that have been presented can produce a result that concurs with either of Sai Baba’s two entirely different predictions of when he would die. The concept of a ‘lunar year’ was challenged as invalid by a devotee! Thank goodness there are some clear-headed and honest ones among them. However, some Hindu calendars do operate with the idea of a lunar year, though it is obscure and Sai Baba has never said he spoke in terms of lunar years. Had he done so he should have celebrated his birthdays on entirely different dates. His 85th birthday would then have been somewhere around 94, but he never did that once. A person calling himself Dhanashen (another ever-anonymous Sai Baba poster who attacks me) made a long posting on chakranews.com part of which I include here because it shows the very weak and inconclusive hints he and other supporters of the unworkable lunar year calculation consider definitive proof. The cited passage simply refers to the use of the standard world calendar rather than ‘the’ Hindu calendar. The Hindu calendar has undergone many changes since its beginnings and there are several versions of it. No version of it allows a calculation that amount to either 92 or 96 years, as has been shown well enough in the above links. 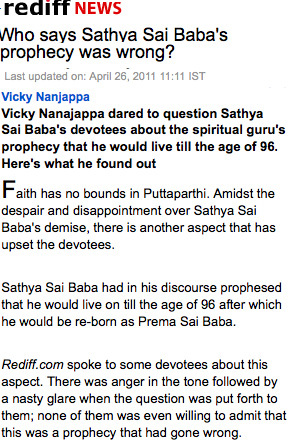 This entry was posted on May 27, 2011 at 12:26 pm	and is filed under Cults, Gurus, Sathya Sai Baba. Tagged: lunar year reckoning, Sai Baba's age. You can follow any responses to this entry through the RSS 2.0 feed. You can skip to the end and leave a response. Pinging is currently not allowed.